For those that didn’t make it to the persimmon exhibition here are the plans they are proposing for BAN5, North of Hanwell Fields. Having spoke with the representatives for a while I found out that persimmon already own the land with the houses marked on the plan, but as yet they don’t own the rest. Which means Lord de la warr has already sold some of what he owns. The field to the right is owned by Mr. Donger, so that will be sold very soon. Presently the plan only shows 350 (approx) properties, the land to the right would also be developed once purchased from Donger, taking the number to 400 properties. The main access to the site (at the moment) comes from the Warwick Road. The public footpath to the left is intended to be paved. These plans don’t mention the green buffer that has to be included, and when asked I was told it would just be open space between the current ancient hedgerow and Hanwell Village, so that’s the field then. If the land to the East is sold then access would come off Winter Gardens Way. Although different houses are not shown on the plan it is based up on providing 30% social/affordable housing. The proposed designs of the houses looked like painted (well multicoloured) seaside style houses, not very inkeeping with the feel of the countryside. There is no planned provision for schooling except integration in to existing schools, when asked I was told they had a list of schools available with such places. If anyone has more information about this then please let me know. Another thing I put to them is the density of the housing as Hanwell Fields, as we know is rather cramped. From the plans I suggested this might make matters worse, as these houses are also crammed in, I also noted that most houses would have shared drives and more likely single car parking plus a garage for some. My recent calls to estate agents have proved this is a major draw back on the saleability of our own homes. 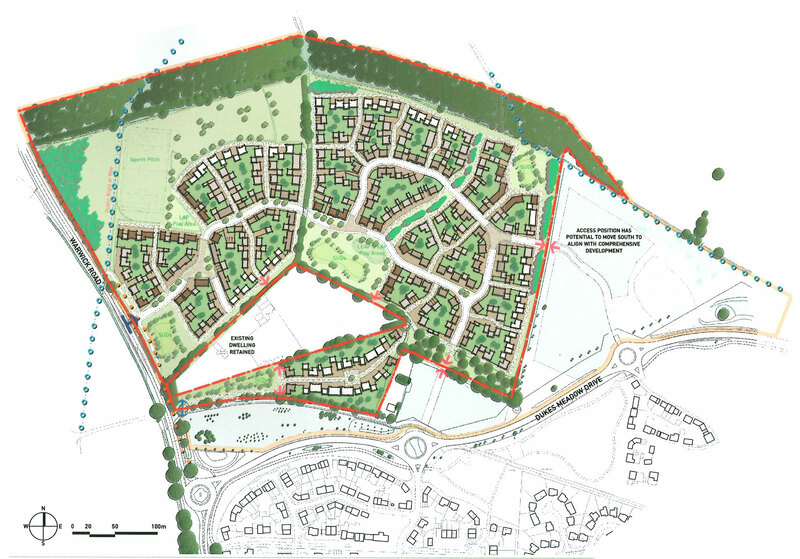 A planning application is being considered at this stage since Cherwell District Council are experiencing difficultly in boosting the supply of housing needed to meet the Government Policy as set out in the NPPF. (National Planning Policy Framework). I’d just to like to add this is completely wrong and one huge lie. The NPPF numbers are lower than what Cherwell are estimating, which is why we are opposing it. So this statement is false. They are putting forward their plans now to maximise their chances of getting the area on the CDC Local Plan. I attended this morning too and told them in no uncertain terms I thought it was a terrible plan. There is definitely a wider agenda, including the retained house and land that they have the cheek to list as a feature…when in fact it will be another 30 -50 houses. On schooling, they said to me that they would make a contribution, and that’s it, and that Ban 2 would have a school. I think this is very unlikely, as the developers will plot and scheme forever to avoid this. Also, the County Council produced a list of planned schools last week, and included a primary at Bankside…but nothing this side of town. We can talk more tomorrow about this.